The mother of the Chatsworth toddler dubbed Baby X has been sentenced to 20 years in prison for the abuse and murder of her daughter. The 34-year-old woman was sentenced earlier, four years after the child was found dead, tied to a bed. The 3-year-old Baby was found to have been starved, tortured, and sexually assaulted. "Justice, justice has been served for this little girl" could be heard being chanted by community members outside the courtroom. In handing down sentence, Judge Mohini Moodley said she was of the view that there was an element of diminished responsibility in this case due to an intellectual disability resulting from a prior car crash. She viewed this as compelling circumstance when handing down judgement. However, Moodley said the woman lacked remorse and tried to pin the murder solely on her mother, the girl's grandmother, who died in prison. 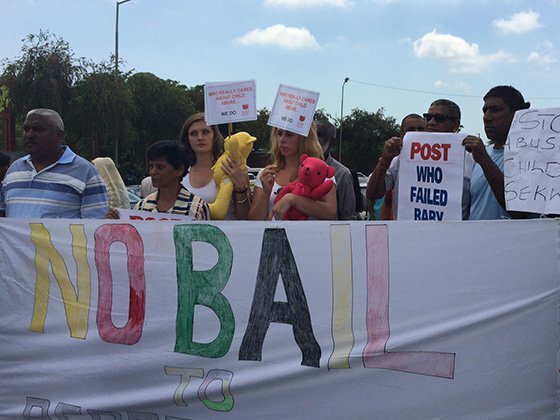 Moodley said society had failed Baby X, adding that she was a textbook case of abuse that was not picked up by social workers or teachers. She said the child would still be alive today if people had done their work diligently.